If due to patriotic or economic reasons you choose to spend the Easter holidays in the area of the southern Bulgarian Black Sea Coast instead of the northern Mediterranean in Greece, we suggest expanding your vacation by visiting several landmarks symbolizing the “finishing” of the Bulgarian transition and the usurpation of the most valuable Bulgarian resources by the political mafia. The route takes about an hour and a half by water and three hours by land. If time and finances allow, we recommend that you head to the tour boats on the pier of the renewed Port of Burgas. As a cheaper option you can look for a fishing boat in the illegal fishermen village known as “Chengene Scale”. But to reach it, you must go by car or bus. The boat tour along the southern arc of the Burgas Bay is a romantic and picturesque. When coming out of the Port, head to Kraimorie. Before you reach this quarter of Burgas, you will go through a beautiful coastal area around the nearby Cape Foros. There you will see several discrete beaches, nestled under beautiful green meadows. The meadows have been privatized at the beginning of the new century through fraudulent transactions, corruption and violence. They are currently owned by firms of attorney Todor Batkov (representative of the shady Israeli-Russian businessman Michael Chorny). Bivol has all the documentation on this scandalous affair, which has so far remained hidden from the public eye and has not been subject to a significant investigation. Ten years ago, Batkov announced that he was planning to build a mega vacation village on the beach and even launched a campaign for it in a joint press conference with then-irremovable socialist Mayor of Burgas, Yoan Kostadinov. With this perfect location, it is amazing that so far this part of the coast has not been buried under concrete as Meden Rudnik, but the explanation is trivial: Batkov went bankrupt and has no money to build. We pass by Kraimorie with its concession beach and a few hundred meters after the last houses, you will see a not very elegant building, resembling a hangar. The hangar, however, is a true monument of the mafia culture. It housed an illegal cigarette factory busted by the Unit for Fight against Organized Crime in 1995. The factory owners were partners in Theo International – current Prime Minister Boyko Borisov, his former girlfriend Tsvetelina Borislavova, Rumen “The Pasha” Nikolov, Angel Bonchev and one of the local oligarchs of the “transition” – Emil Raykov, who is still wanted as credit millionaire. The anti-mafia police and the tax authorities’ bust deprived of livelihood half of the grannies in Kraimorie who packaged the finished products. This, however, was concealed by the police in Burgas, and the police officer, who alerted the gangsters about the raid, giving them time to dismantle the machines in the factory, was appointed chief of the Burgas police department at the time when Borisov was Chief Secretary of the Interior Ministry. After retirement, the same person was given a managerial job in IPON Burgas, Borisov’s former security company that guarded Lukoil. In 1996 Boyko Borisov and the Pasha sold the company to Ivo Kamenov from the Varna-based notorious group TIM. The machines were exported abroad by ship, according to documents, but actually went to Northeastern Bulgaria, where they continue to operate for the business of other landlords. However, even today, in the halls, which are now used as a garage by a taxi company, one can find residues of the tobacco and the packaging that were stored there. The next landmark on the route is the fishermen village “Chengene Scale” and its illegal posh houses. Some of them were torn down in a PR action last year and their remains eyesore the landscape because no one has thought of cleaning, removal and recovery. The history of these illegal buildings is a textbook one. In the 1990s, the infamous Burgas goons “sold” the State lands to rich people and notables who started building without permits. It was an open secret that anyone could enclose in their sole discretion State or municipal forest, fell and build whatever they wanted without any building permit, coordination, etc. This absolutely mafia dealings were protected by State and municipal authorities who took their share in the form of bribes from those who wanted to launder certain amounts of money in the illegal vacation village. There is no way to issue permits because on paper the lucrative properties there are still public. Most plots are listed as forest or park area. Thus an entire holiday village without a single legal structure was formed spontaneously. One can distinguish very well the modest fishing huts that look like a Brazilian shanty town from the disproportionately luxurious palaces in their vicinity. The paradox is that the protests of the poor fishermen against the destruction actually defend, without realizing, the interests of bandits “squatting” on public land who turned the former fishermen village into a mafia den (see here). Immediately after “Chengene Scale”, we pass by “the border with the Russian Federation”. We go into the water area of the oil terminal Rosenets, given on concession for 35 years to Lukoil. From the sea one cannot spot the massive double fence with barbed wire and CCTV every 50 meters, which surround this Russian enclave where Bulgarian customs officers and policemen cannot set foot. The armed guards are from the company Lukoma, whose seat is in Moscow. The concession was decided by the first government of Boyko Borisov with the aim to generate supposed economic benefits, but a check Bivol under the Access to Public Information Act (APIA) established (see here) that received concession royalties do not exceed the port charges paid by Lukoil when the port was State owned. In addition, in their essence, these port charges were more than symbolic and one can say that in reality Lukoil has enjoyed and used for free the State port since 1999 – a fact that is particularly indicative of all Bulgarian governments during this period. Now, the second government Borisov is preparing amendments to the law on concessions in order to make them timeless. We are ready to bet that if it passes, the first permanent concession will be for Lukoil. After enjoying the fine white tanks with the logo of Lukoil and the huge tankers with Russian oil that are waiting in line to be unloaded, ask the captain to take course towards Island “Saint Anastasia”. Immediately after the oil terminal, you will find in front of you and in its entire splendor the new seraglio of Ahmed Dogan, the Honorary Lifetime Chairman of the party largely representing Bulgarian Muslims – Movement for Rights and Freedoms (DPS) – a three-story palace with a tower in the middle, perched on the southern tip of cape “Chukalyata”. In front of it, there is a tracery rotunda for sweet outdoors chat under the sea breeze. Come close without fear to the pier of the small port there. The sea area is still State territory as well as is the port. You can even get off the pier and walk along the small beach which is exclusive State property. The guard is very kind and can even allow you to go down the path that connects the port to the beach. This way, you will enjoy the statue of a mermaid with big sad eyes (author unknown). The story of the seraglio was detailed in two investigations of Bivol (see here and here). In brief, we are talking about 300 decares of land that has belonged to the State in one of the most beautiful places south of Burgas – Park Rosenets, formerly “Otmanliy”. Ex-Prime Minister Ivan Kostov gave it to Lukoil in the symbolic “privatization” of the oil refinery Neftochim, then Valentin Zlatev, boss of Lukoil Bulgaria, made a second privatization through a controlled offshore company for pocket change. Finally, the offshore sold part of the land to the former yacht club “Neftohimik” owned by the company “Hermes Solar”, linked to Dogan. “Hermes Solar” received a 12-million loan from the now-collapsed Corporate Commercial Bank (CCB) without ever intending to repay it or invest it and began building the seraglio designed by architect Kalin Tiholov. According to people familiar with the credit file, the loan was drawn for something else, namely to build a factory for the production of photovoltaic panels. This is probably a large-scale diversion of funds or laundering of tens of millions because “Hermes Solar” has inevitably been at a loss since its inception. The ground breaking ceremony was held immediately after the bankruptcy of CCB. The non-performing loan was covered by a direct transfer to First Investment Bank (FIB) – the new bank of #WHO. Local authorities in Burgas issued in no time building permits and even gave up ownership of the street that leads to the seraglio in order to cut off access by land. Everything has been coordinated swiftly, because Boycho Georgiev, the nomenclature chief of the Regional Directorate of Environment and Waters (RIEWs) in Burgas and municipal councilor from the quota of Borisov’s ruling Citizens for European Development of Bulgaria (GERB) party, even issued an opinion that the massive construction did not require an environment impact assessment. With that, the new huge palace falls within the protected area “Bakarlaka”, approved as such with a final decision by the Council of Ministers in issue 107 of the Official Gazette from 2007. The area was established under the European Directive on conservation of birds and it expressly bans any construction, quarrying and other activities that lead to change and destruction of the landscape or the water regime of the area, the picking of wild flowers, herbs, trimming, breaking branches and damaging trees, and felling, except sanitary, for cultivation, etc. The opinion of Boycho Georgiev is not surprising, given his more-than-scandalous activity in the legalization of the outrageous construction on the sand dunes near the coastal town of Nessebar, exposed by Bivol four years ago in the affair “Dunes Gate“. The total and fervent support, even beyond the borders of legality, for the construction of the seraglio associated with Dogan and Peevski, by the Mayor of Burgas and Deputy Chairman of GERB Dimitar Nikolov, is especially surprising as his political and administrative team unimpededly legalized this construction outrage during the term of the previous Socialist-endorsed government against which GERB and Borisov allegedly protested! The access is maybe reinstated, at least for now, after Bivol made the outrage public and the Burgas Prosecutor’s Office nominally reacted and looked into the case, unfortunately, without investigating the affair in essence – illegal building permits and possibly money laundering without clear origin, and we are leaving aside the destruction of natural resources, although it is striking. It is notable, however, that the seraglio’s tower hovers 17-meters above the ground, with construction parameters allowing a height of up to 12 meters as required by law. According to local architects, who have approved the draft design of Tiholov, the architect of DPS, this was a decorative element. The same architect has closed the road with a barrier until completion of the works, which have long been completed, but the Burgas Mayor is adamant that the barrier will remain until the palace receives the so-called “act 16”, meaning it is ready for use, and this can happen in an indefinite time period in the future. 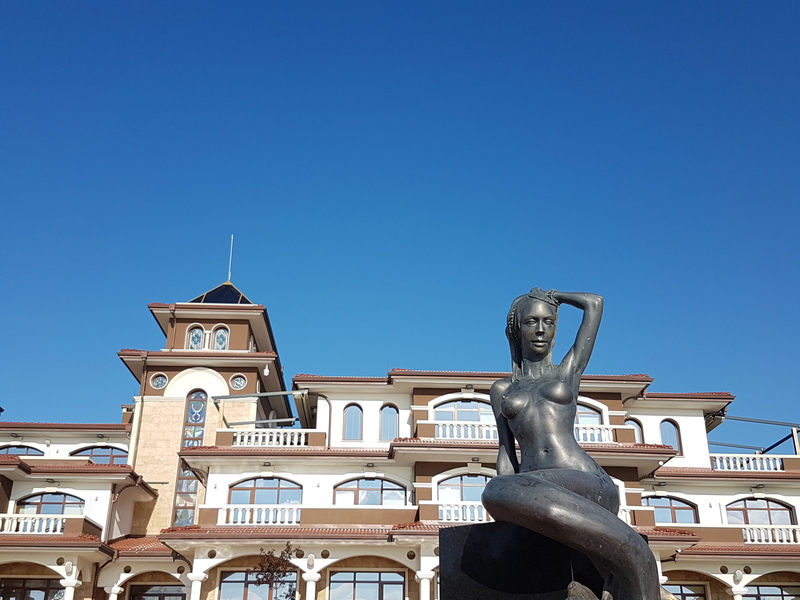 If you are visiting the seraglio by land, from the highway in the direction of the town of Sozopol, exit at the fork to Yasna Polyana and follow the road to Park Rosenets. Pass by the Russian enclave along the mighty fence surrounded by security cameras. It is not bad to take into consideration that this area is guarded hundreds of times better than the State borders of Bulgaria, probably because it is practically the border of another country (in this case the Russian Federation). After the end of the Russian double wire enclosures, take the fork to the right, make a left at the next junction and you will reach again the fence of the enclave. After the small turnaround, take a right onto the asphalt road. You will reach a barrier that blocks the road and that is located about 200 meters from the building. Park there and continue on foot. Do not give up at the barrier if they do not allow you to pass beyond it. Stand for your rights. The road is municipal. The beach and the port are public. If the guards speak otherwise, warn them that the prosecutors are investigating illegal restriction of access and that you will call the police. This will do. If they still fail to let you pass- call the police, but use necessarily the 112 emergency hotline because the conversations are recorded, i.e. your signal can be verified in an irrefutable way. But let’s go back to the boat tour. After enjoying all “architectural elements” of this Sultan wreath of the state-mafia symbiosis, continue to the island of “St. Anastasia”, where the former monastery has been restored with European money. The island, known during the Communist dictatorship by the name “Bolshevik”, is once again a tourist attraction. In the time of the monarchy, it was something of a Bulgarian “Alcatraz” where political prisoners and terrorists were jailed. Not a bad idea and maybe it will be re-implemented. Imagine the above statesmen exiled there under Spartan conditions for 10-15 years. Imagine them pitifully watching every day the unoccupied and unlived luxurious palace. They will probably dream once again how to escape to the Soviet Union, following the example of their predecessors in 1923. Your mood will immediately become festive.